Do you own a backyard swimming pool, a fountain, or care for a baptistery in The Colony? Texas Fiberglass Pools Inc. offers a full range of The Colony Fiberglass Pool Repair and pool maintenance options. We’re here to help you keep your pool in terrific condition whether it’s a family swimming pool you’ve had for 20 years, or it’s a beautiful new fountain you just had installed in your front yard. Ensuring regular maintenance and quickly repair of issues that may occur with your swimming pool will help you enjoy it for as long as and with as few hassles as possible. Are you concerned about a potential leak in your backyard swimming pool? Would you like to learn about options for regular maintenance of your baptistery or fountain? Get in touch with one of our pool experts today, and we’ll discuss the ways we can help you keep your pool in working order. Regular visits from a pool maintenance expert can help make sure your pool works all season long. At a certain point, just about every pool will experience a few issues with plumbing or the need for new equipment, and we can help you fix, repair, or replace virtually anything in and around your pool. Did you know that a small pool leak may turn into a rather expensive problem if you don’t get your pool repaired quickly? If you suspect a pool leak, it’s important to give us a call to diagnose the problem. Even if it turns out your suspicions were incorrect, it’s better to be safe than sorry when it comes to what could turn into a very costly repair job. Our experienced team can help you solve your pool problems fast and keep your pool in great condition. The Colony Pool Resurfacing with Texas Fiberglass Pools Inc.
We’re your one-stop shop for everything pool-related, from pool resurfacing and repair to occasional maintenance visits. We handle work on residential pools, as well as commercial pools, and we can help you with unexpected problems, as well as routine work. Need to resurface your fiberglass pool? Let us handle it before the summer season starts. 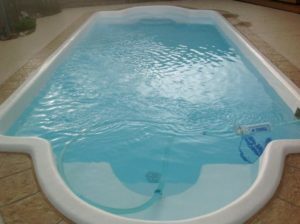 Let the The Colony Fiberglass Pool Repair experts and professionals of Texas Fiberglass Pools Inc. help with your swimming pool in the Colony. Contact us today!